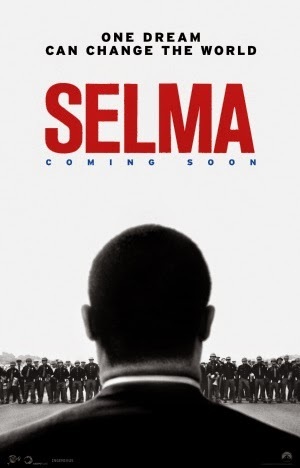 The lineup of accolades for Selma is hideously small, and aside from the Golden Globes, most award ceremonies have snubbed a major thing - a Best Actor nomination for David Oyelowo, who portrays Martin Luther King, Jr. in a compelling historical drama regarding the activist's efforts to restore equality in a discriminative America. His performance is exceptional to say the least, making this lack of recognition a massive offence, yet it's far from Selma's only compelling attribute - meant in the best possible way. As we've established, Selma explores Luther King Jr. and his protestant efforts to allow the black people in America to vote freely without harassment and control. We explore his relationship with President Lyndon B. Johnson (Tom Wilkinson) as he attempts to cure America of it's racist values, and his large scale protests in Alabama, from Selma to Montogomery; spearheading how his vision changed the world forever. The first thing that many people will witness is, of course, Oyewolo's performance - and he masters everything: the accent, the annunciating voice, and the protestant nature the character wields. There's not a single thing wrong with it - and he's not the only one. Tom Wilkinson as President Johnson shows us a man who is trapped between societal expectations and his own emotional beliefs, and Tim Roth delivers an intimidating role as George Wallace, the discriminative governor of Alabama. Their performances confidently steer what's already a meaningful narrative, and it doesn't hold back; showing us the true brutality and violence of this time period, and flawlessly conveying the emotional turmoil the character's endure as the story progresses into darker territory. Selma allows us to stand back and acknowledge an ugly truth - the events of this film were barely fifty years ago, demonstrating how recent America's racist methodology really was, and how we as a species still have a long way to go before Luther King's true goals will ever be met. It's not just entertainment, but a deep political allegory, assessing the human race's biggest flaws in terms of cultural identity; and showing the god complex the White man did indeed feel at the time, and in some cases still feels today. Bold and unrestrained, and beautifully acted, Selma is a film that understands it's underlying messages and political themes without resorting to pretentious cliches.